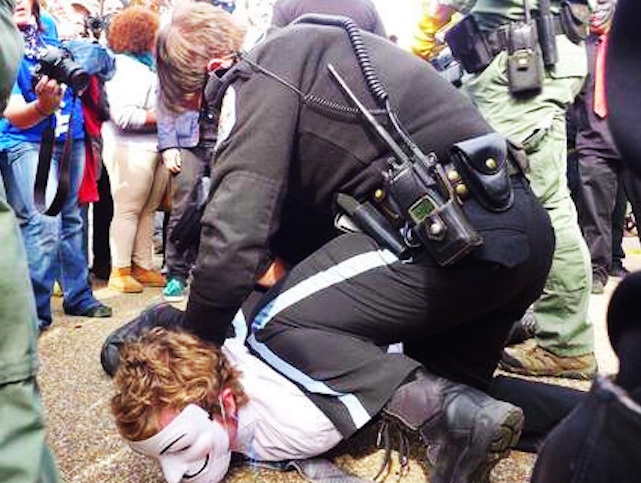 A man in an Anonymous mask, who was sitting peacefully was harangued by police and arrested. All caught on camera, bystanders who recorded the event with a multitude of witnesses yelled out that he did nothing wrong or illegal. The incident took place in the House Gallery during the Maricopa County hearing regarding the suspected election fraud. Two officers attended the arrest of the man. The man in question didn’t have his face concealed with the mask, rather has it resting on top of his head, when the first arresting officer approached from behind and kicked at him lightly until he left his chair. Bystanders went to the man’s defense, with several phones filming the event. One bystander even said the arrest was simply made because the man was sporting an Anonymous mask. As the event unfolds, another accuses the police of choking the man as they unduly restrained him while quietly sitting on the ground between the chairs. Chants of “Shame” and “The whole world is watching” were cried as the man was escorted away after being forced to his feet. “We the people of the United States are tired of this stuff,” another yelled as a bystander warned this would all end up on YouTube. Previous How Trustworthy is the Mainstream Media? You always run the risk of raising suspicions when wearing any type of costume involving head gear. I can see the day coming when Halloween will be a victim of our self-censorship. The question is, will you as the individual allow such a thing for yourself? I was a goofy person most of my life, one day in my early 20s I walked around my hometown to several stores in a Darth Vader mask. One store owner asked me to remove the mask before entering the store, I complied and understood why…fear of the unknown. The crime rate couldn’t get much lower in the area I live in but people still live in a high level of fear, an emotion we’ve been conditioned to emphasize the past 15 years.